Info "Give these flies a tongue-lashing!" Critterific is one of the animal-themed microgames featured in Kat and Ana's stage, in WarioWare: D.I.Y. Showcase. There is a lizard and three flies. 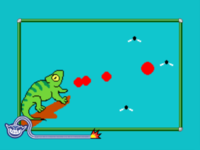 The player must tap the flies to make the lizard eat them. The game is won when the lizard has eaten all the flies. This page was last edited on October 8, 2018, at 22:21.